Mauricio Pochettino does not think he has "missed the Real Madrid train" but reiterated he is happy to stay at Tottenham. Pochettino, who signed a contract running to 2023 last year, was strongly linked with the LaLiga giants after the shock resignation of Zinedine Zidane following Madrid's third consecutive Champions League title. After Julen Lopetegui's short reign Pochettino was reportedly again a top target for Madrid president Florentino Perez, but he remained with Spurs. Zidane is now back at the Santiago Bernabeu after Lopetegui's successor Santiago Solari also failed to see out the season with Madrid, the Frenchman signing a deal to June 2022. 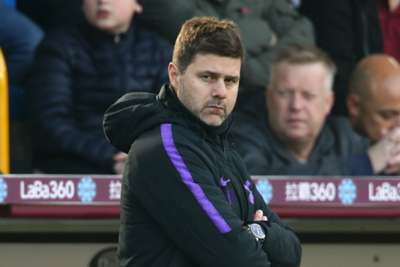 But Pochettino, who has also regularly been connected with Manchester United, indicated he believes the chance to manage Madrid may come his way in the future. "I don't have the feeling that I missed the Madrid train," the Spurs boss said at an event in Barcelona on Monday. "I don't look at the long term, I'm very happy and I still have four years left on my contract." "There are always rumours, not only with me but with other colleagues, but 90 per cent are false. I'm very happy at Tottenham." Last week's Champions League draw paired Spurs with Premier League rivals Manchester City, who they will now face three times in April. Manchester United will take on LaLiga leaders Barcelona with Pochettino hailing the fine form of captain Lionel Messi, who scored a stunning hat-trick in Sunday's 4-1 win at Real Betis. "Barca have excellent players, extraordinary players and then a genius," Pochettino added of his fellow Argentinian. "He is different, he does things that nobody expects and continues to surprise. "What surprises is his regularity, his consistency. He does it in every game, every three or four days, during the last 11 or 12 years, leading in the first team. "I've been lucky to have seen him and I''ve also suffered against him, it's a shame not to have had a player like that on my team."